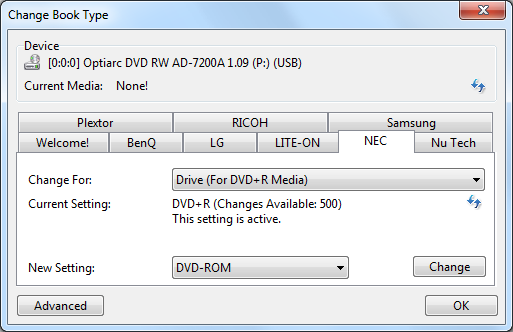 In this guide you will see how NEC/Optiarc drives can book type DVD +R and +RW single layer media. With original firmware only +R DL media will be book typed to 'DVD-ROM'. Certain older DVD players, including DVD players in some laptop computers, will not load DVD+R discs at all because those formats did not even exist when the player's firmware was written. However, by changing the book type on a DVD+R to DVD-ROM, those players should be able to load and play the DVD+R. 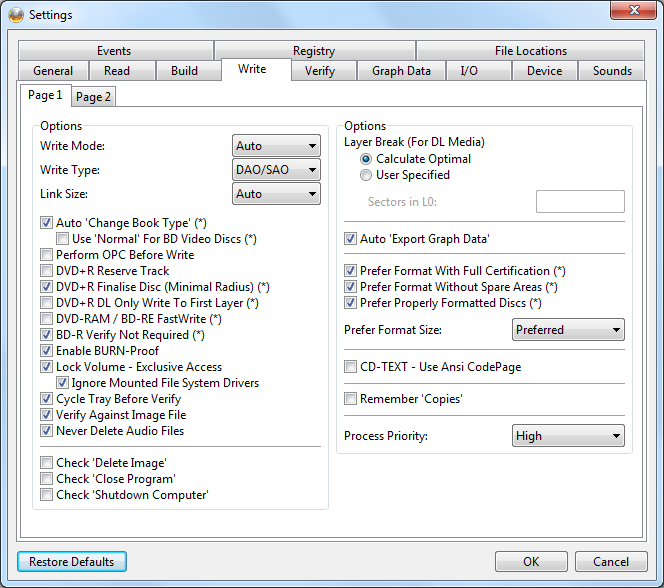 With official NEC/Optiarc firmware only the options for +R double layer media works in the 'Change Book Type' function, that is located in the 'Tools' menu. When you press the 'Change' button to change the book type setting, you will get an error window. In the ImgBurn log you will also see that the 'Book Type' is set to the same as the 'Source Media Type', when you burn a +R or +RW single layer disc. So what you need to do is to flash the burner with a patched firmware, that sets the book type for you and also allows for the options in the 'Change Book Type' function to be working. You can read more about how the 'Change Book Type' function works in the 'Functions Guide', section '4.2.12.4 NEC'. In this guide I will use the Optiarc model AD-7200A as an example. Go to Liggy's and Dee's modified NEC and Optiarc firmwares page and click on the '7200 / 7201 / 7203' row in the column of 'Drives'. 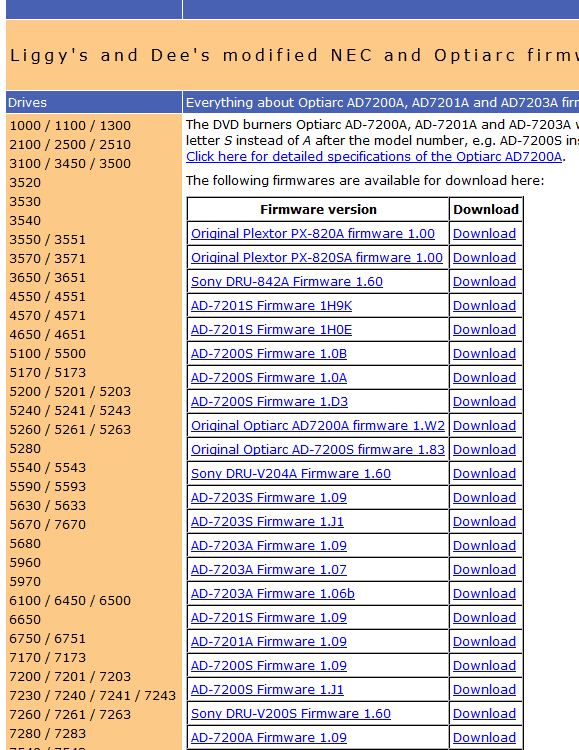 As I have the Optiarc AD-7200A model, I then click on the 'Download' link in the column 'Firmware version' for the 'AD-7200A Firmware 1.09' row, as 1.09 is the currently latest version of the official firmware for this drive. Save the file to your hard disk. You then need to unzip/extract the downloaded file to your hard disk. This can be done with the free program 7-Zip or any other similar tool. Go to the Binflash web page and download the current GUI version to your hard disk. Select either the 'Win32 GUI' or the 'Win x64 GUI' version, depending on if you are running a 32 or 64 bits Windows system. Run the file 'NECWinFlash.exe' from the location where you extracted the downloaded Binflash file. 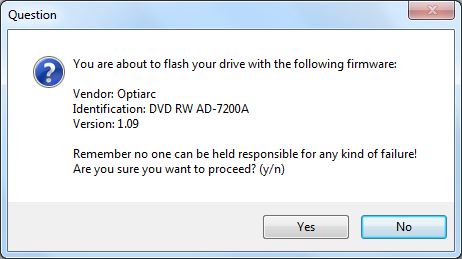 Before you flash the drive, make sure that you have no disc in the tray and that the tray is closed. Also close down programs that can affect the flash. Make sure that you have select the appropriate drive in the drop down list of installed drives. 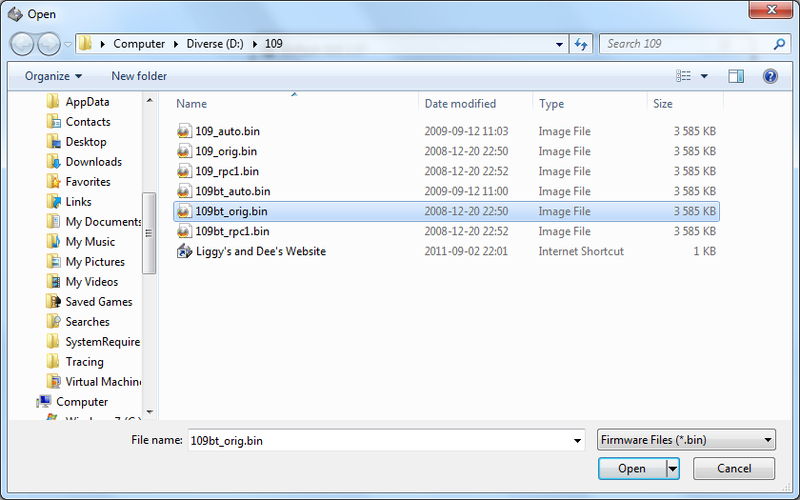 If you open up the file 'readme.txt' that is located inside the unzipped folder from the download from the 'Liggy's and Dee's modified NEC and Optiarc firmwares' page, you can read more about the included files. In this case we want the firmware that includes the booktype patch - the file '109bt_orig.bin'. Press the 'Flash' button and browse to the location where you extracted the downloaded patched firmware folder and select the file named '109bt_orig.bin'. The flash of the new firmware takes place. If the flash was successfully you will see this window. Now you need to restart the computer so the new firmware can be recognized by Windows. Press the 'OK' button, close down Binflash and restart your computer. Check in the ImgBurn settings that the option 'Auto Change Book Type' is enabled. You'll find this setting by selecting 'Tools' in the main menu of ImgBurn and then the option 'Settings'. Go to tab 'Write - Page 1'. 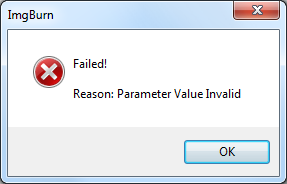 If it's not enabled, enable it. The next time when you burn a +R or +RW single layer disc you will see that the 'Book Type' is changed to 'DVD-ROM'.